Police have still found no sign of Ariel Kouakou, the 10-year-old Montreal boy missing since March 12. Dozens of volunteers, led by Ariel's father Frederic Kouakou, will mobilize and continue searching for the boy Saturday morning. Search parties believe that searching areas where the snow is melting may uncover new clues. On Friday, search efforts took volunteers to the shores of the Rivieres des Prairies with a specially trained dog on loan from the Nova Scotia RCMP, specializing in ice and water searches. Meanwhile, a boat belonging to Hydro-Quebec is once again cruising along the shores of the river and breaking up the ice. 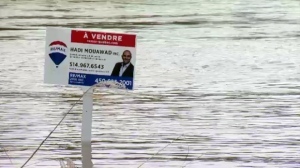 Montreal police divers have also been searching the river, but it was unclear whether they would be in the water again Friday. Ariel left his family's home in the city's north end on March 12 to visit a friend's house, and a witness spotted someone matching his description in the park near the river shortly after. Police believe he most likely fell in the water and drowned, a theory that Kouakou's family and some volunteers have rejected. "Today, we were circling with police," said volunteer Mamadou Cisse. "We think (Kouakou) has been kidnapped and that's the way we want the police to look for him." The SPVM said the last video recording they have shows the young boy entering the park, but never leaving. But because of the weather and the outfit the boy was last seen wearing, family and friends aren't convinced that he came to the park at all. "I have to follow the police instruction, but I'm not really sure the kid would come here - I'm really not sure," explained family friend Konan Bernard. "But we have to do what the police asked us to do." "Since this morning, we have been helping the police find some new element - we didn't have any new element. So for me, I want the police to work on the theory I am for, and that is the kidnapping," Frederic Kouakou told reporters Saturday. Andre Mouchbahani, a longtime coworker of Ariel's father, said that the abduction theory shouldn't be completely ruled out since no one knows what really happened. "Talk to Ariel, just speak to him and you'll see he's a very compassionate little boy. He's very kind - his family misses him," Mouchbahani said. "Please bring him back to the family." 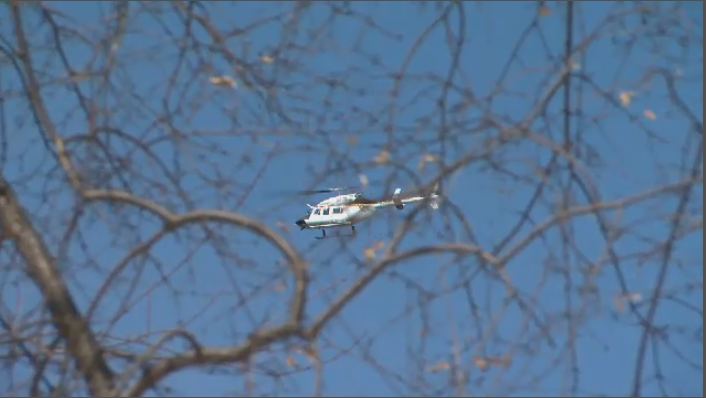 Using helicopters, police search the Rivieres des Prairies area for Ariel Kouakou, a 10-year-old boy missing since March 12, on Sat., March 31, 2018.